If you’ve ever played Farmville or Mafia Wars on Facebook, you might consider trying your hand at a new game. It could help land you a new job, too. 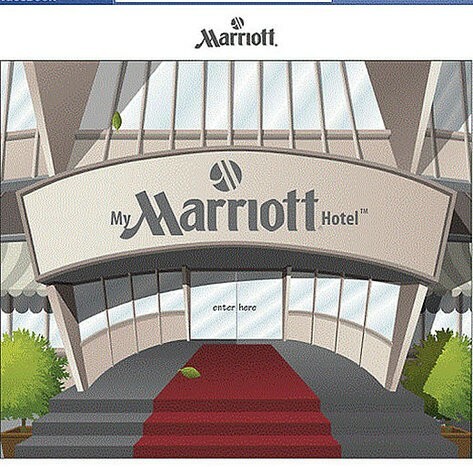 Marriott International launched a new Facebook game this week called My Marriott Hotel, and players are able to try their hand at managing their own hotel. And while games have been tried at various times on corporate career sites or standalone sites, this is one of the first times it has been tried on Facebook (where the viral nature of the game can spread much easier). I was able to log-in from Facebook and started playing immediately. After picking your general manager, I started by setting up my oven and started cooking meals. After the first couple of orders, more and more orders would come more quickly and I’d have to figure out how to queue them up as well as check on my completed orders. Soon enough, I would move on to another area in the kitchen like ordering ingredients and as you progress through the game, you learn more and more about the components of the various areas of the hotel. Not wanting to fall back into my days of playing Farmville, I quietly exited the game (I found out later that I could resume my place in the game just as easily). Will it simulate working at a hotel? Sure, the same way Mafia Wars prepares you to be in the mafia. But that’s not the point. The point is to have people interact with it (and of course, eventually, drive traffic and hires). Is it working? Maybe it will have to. Marriott is planning on hiring for 50,000 new jobs by the end of the year. That is according to Susan Strayer, Senior Director of Global Employer Brand and Marketing for Marriott. She told me that the game has been played in 91 countries and has increased the profile of their Facebook page. In the first week alone, they’ve seen an increase of over 1,500 likes (a 20 percent increase by my calculation) of their page and 15,000 more page views. More importantly if you’re a recruiter, at the top of the game is a “Do It For Real” button that takes you to their careers page. And any likes of the career page means that they will be getting updates on their Facebook wall. As I’ve seen with other social recruiting efforts, it takes time for these to develop into hires. So it might not help much in 2011, but it could help quite a bit in 2012 and beyond. Will everyone be developing a social game? So the question is: does this make sense for other companies? For most companies, it probably doesn’t. Even for those with the size to pull it off, executives might choose to invest in other, more surefire ways to recruit. And many companies may be looking at specific demographics that don’t align well with Facebook’s top users. For Marriott though, it makes sense. They have an international presence (where Facebook is growing faster than it is in North America) and many of their hires come from those under 30. That makes Facebook prime real estate to develop something that is both branding focused and (hopefully) building a longer term pipeline for direct hires. As all of these initiatives go, the real juice will be in the results further down the road. For now though, I’ll stop plowing my crops and start making some meals in my virtual hotel kitchen. Lance Haun is an editor at The Starr Conspiracy, a marketing agency focused on the enterprise HCM market. He spent three years as an editor at ERE Media and seven years in the recruiting and HR trenches before joining the agency. You can follow him on Twitter, circle him on Google+, check out his blog or contact him directly at lance@coug.rs.